HONG KONG (Apr 18): Stock pickers may have to reconsider the way they think about China. Dismissed by many as a casino after its wild boom and bust in 2015, the country’s US$7.6 trillion equity market has quietly turned into a place where fundamentals matter. 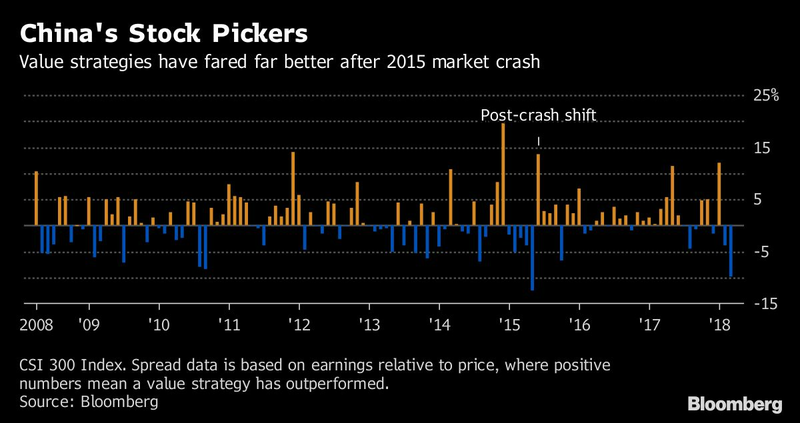 Chinese shares with the most attractive dividends, profit revisions and earnings yields -- metrics used by Wall Street pros for decades -- have trounced the nation’s benchmark index by as much as percentage points over the past three years, according to data compiled by Bloomberg. That’s a big shift from China’s pre-crash days and it underscores the growing role of institutional money in the world’s second-largest stock market. It’s also good news for foreign fund managers as they prepare for Chinese shares to enter MSCI Inc.’s global indexes in June. It suggests that, in the long run at least, stock-picking skills honed on international exchanges can deliver outsized returns in a market once seen as hostage to the whims of unsophisticated speculators. Morgan Stanley’s recent stock picks include Spring Airlines Co., Zhejiang Huace Film & TV Co. and Zhejiang Runtu Co., a textile dye producer. The companies also jibe with the bank’s favored economic themes, which span mass-market consumption, high-end manufacturing and technology. 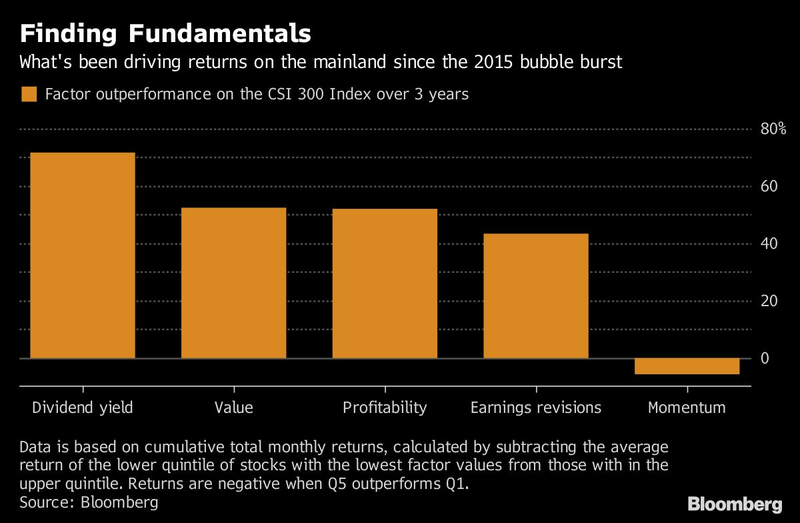 Over the past three years, the dividend and earnings yields of companies in China’s large-cap CSI 300 Index have been the most consistent drivers of stock performance, followed closely by changes in analysts’ profit estimates, according to a Bloomberg ranking of 16 investment attributes (also known as factors in Wall Street lingo). An investor who bought the top quintile of dividend payers in the CSI 300 and rebalanced monthly would have reaped a return of about 28% during the three-year period, before transaction costs. That compares with an 18% slide in the benchmark index. Dividend payers outperformed 76% of the time since mid-2015, up from 46% during the previous seven years. Meanwhile, factors more commonly associated with China’s trend-following retail investors -- such as momentum and relative strength -- have turned into some of the weakest performers. An investor who bought only shares with the biggest trailing 12-month returns would have lost 8.5% since mid-2015. That doesn’t mean trend chasers have disappeared from China, or that the country has suddenly turned into an oasis for fundamental stock pickers. Individual investors still account for a sizable chunk of the nation’s daily trading activity, and they’re quick to jump in and out of hot stocks -- everything from initial public offerings to the perceived beneficiaries of newly-announced special economic zones -- with little regard to things like valuation. Market intervention by government-run funds is another factor that sometimes prevents Chinese share prices from reaching fair value. It’s one reason why some foreign institutions have been reluctant to invest in the country, said Toshihiko Takamoto, a Singapore-based money manager at Asset Management One. While state meddling in China may never go away, the role of institutional investors looks poised to increase -- and with it the influence of fundamental factors. This month, China’s government announced plans to quadruple the daily net purchase limit for international investors who use the Hong Kong-mainland exchange links and said the program would expand to London later this year. On May 1, China will start a trial of 401(k)-style savings plans to encourage long-term investment by its own citizens.